The move, according to manager Terry Francona, was “kind of obvious to me.’’ But even as he helped introduce Mike Cameron in a news conference at Fenway Park, the manager reserved judgment on how his outfield defense was going to be aligned in 2010. He had to speak with general manager Theo Epstein and bench coach DeMarlo Hale. They apparently agreed with his assessment. So, about a week before Christmas, Francona (along with Hale) made a phone call to Jacoby Ellsbury from Florida. 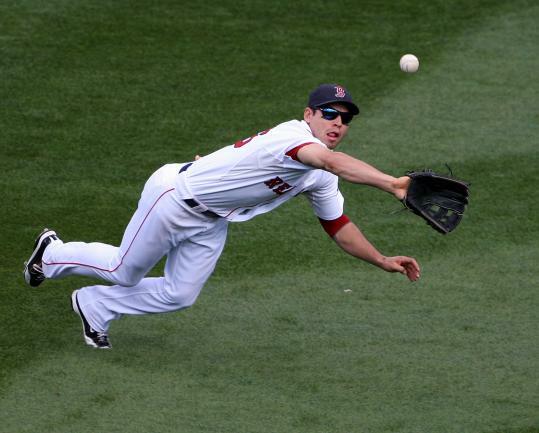 It would be Ellsbury, not Cameron, sent to left field to replace Jason Bay. “The way we’re constituted, with [Cameron’s] long strides and Jacoby’s first-step quickness, it seems that we’re set up better that way,’’ Francona said yesterday. Francona could hear in Ellsbury’s voice that he would probably rather remain in center field. But with the Sox working to put together the best defense they’ve had in the tenure of the current management, he’ll instead be in left. Cameron had offered to play center or left when he signed, despite having played only three games in left in his career. But Cameron, who turns 37 Friday, also has three Gold Gloves, and is regarded as an outstanding center fielder. Cameron’s “ultimate zone ratings’’ in 2008 (11.3) and 2009 (10.0) were excellent, while Ellsbury had a shockingly low -18.6 UZR in center in 2009, far lower than his 3.0 in 2008, according to fangraphs.com. Ellsbury is regarded as a good (and improving) fielder, albeit with a weak arm. “It came down to the fact that Cameron’s experience is almost exclusively in center and Jacoby demonstrated in 2007 and 2008 that he can be an impact corner outfielder defensively,’’ Epstein wrote in an e-mail. “We are more than comfortable with Jacoby in center. We just feel that - for now - this alignment puts us in the best position to win games. Ellsbury has started 51 games in left field in his career, including 36 in 2008. With the additions of Cameron, Marco Scutaro, and Adrian Beltre, the Sox are positioning themselves as an outstanding defensive club, far beyond the abilities of a team that clearly disappointed Epstein in the field in 2009. The buzzwords of the offseason continue to be “run prevention,’’ with John Lackey’s presence bolstering the rotation and the other acquisitions bolstering the defense. “This is going to be our best defensive team we’ve ever had,’’ Francona said. “Every time we’ve played good, we’ve caught the ball very well. You won’t see too many sloppy games. “Those runs we put together when we’re catching the ball, we’ve got a chance to be really good defensively. You’ve got to score, things like that, but this gives us a chance to be a solid team. That’s what we’re trying to accomplish. The idea, too, is that the move from center field to left field for Ellsbury won’t be permanent. discuss Agree with the move?